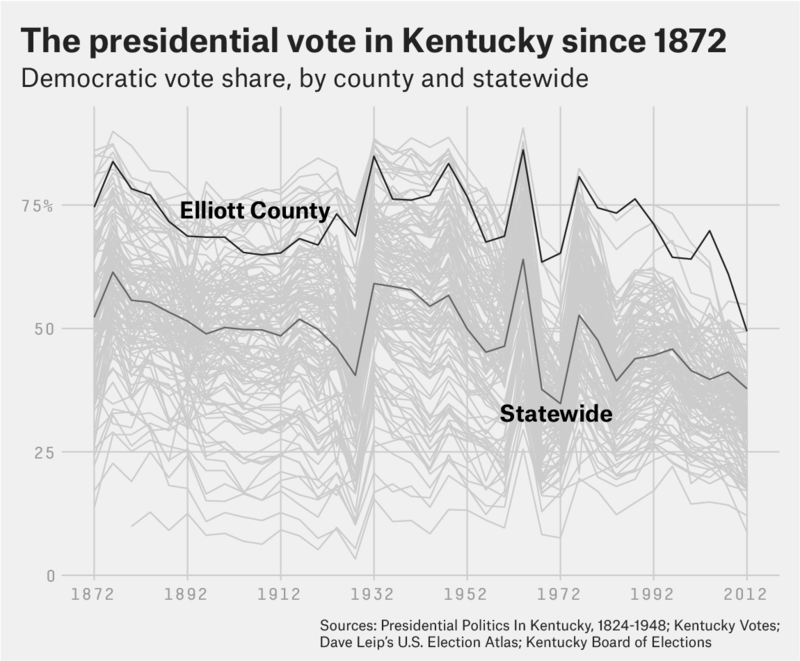 In 2012, voters in Elliott County, Kentucky, came close to breaking a streak that, at the time, had lasted 136 years. Elliott County was formed in 1869, and since its first presidential election, in 1872, it had voted for the Democratic nominee every time — the longest span of any U.S. county. Will 2016 be the end of the streak? Demographically, Elliott County looks like the kind of place where Donald Trump could do well. My colleague David Wasserman estimated that 85 percent of the major-party vote in Elliott County in 2012 was from non-college-educated white voters — the demographic group among which Trump is strongest. Even a small shift among those voters toward Trump could win him the county. The next closest presidential election in Elliott County was 2008, when Obama won by 25 percentage points. Obama got 1,186 votes (49.4 percent), and Mitt Romney got 1,126 (46.9 percent); third-party candidates accounted for the remainder.